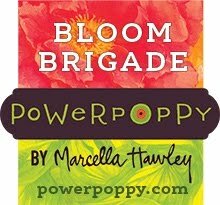 If you’ve ordered stamps from Power Poppy before, you know in addition to providing beautiful illustration and high quality polymer stamps, Marcy goes above and beyond and packages every order with pretty papers, washi tapes and she writes a personal note. Talk about sweet customer service! On our most recent set of stamps, Marcy packaged mine with some striking black and printed paper with trees all over. 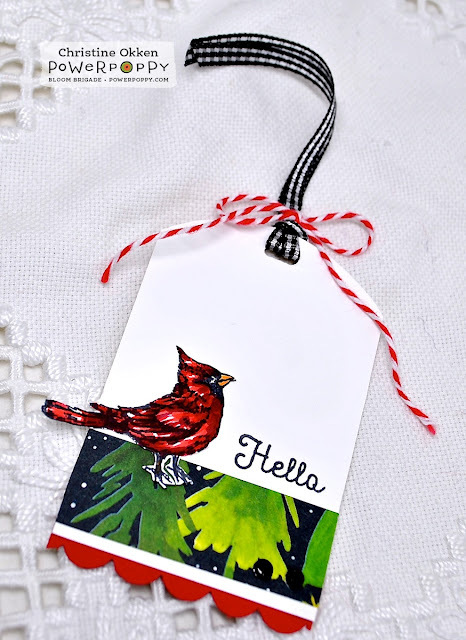 It was just too lovely to waste, so today it has a second life as a card accent and tag. I started with Power Poppy’s Cozy Cupfuls set and coloured it up with Copics. Its still one of my favourite sets with those adorable little cardinals. After cutting their tails a bit “out of the box”, I put it through a stitched circle die. Did you know that female cardinals almost have a green tint to their feathers? 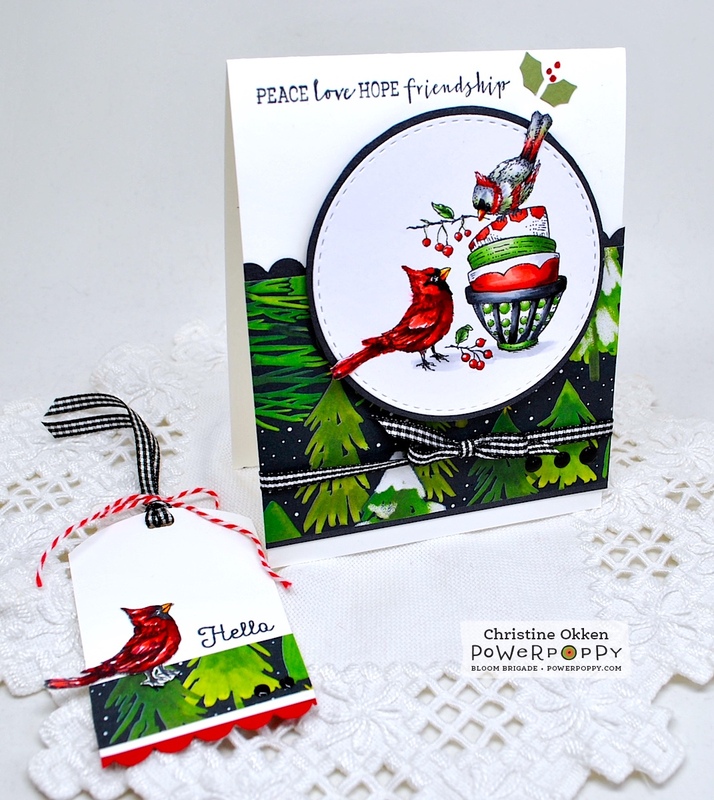 I added some black metallic paper to accent the black of the patterned paper to keep it really simple but festive. I wee bit of holly leaves and sparkly berries accent the sentiment, and a bit of gingham ribbon and Nuvo drops finish it off. I also kept the tag really simple too. I think tags are so sweet, but my gift recipients usually only look at them long enough to rip off the wrapping. 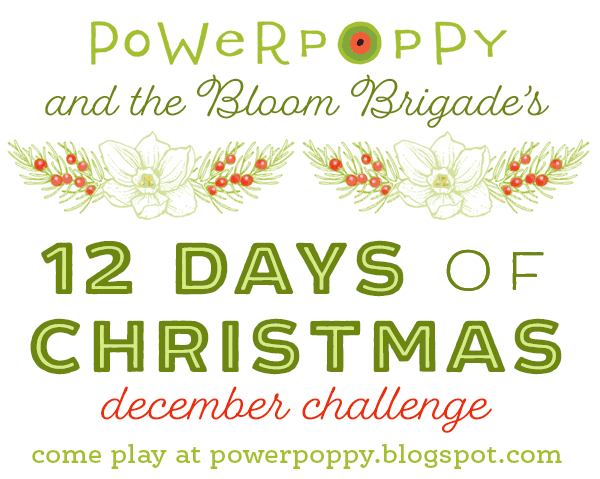 Have you played along yet in our 12 Days of Christmas Challenge? 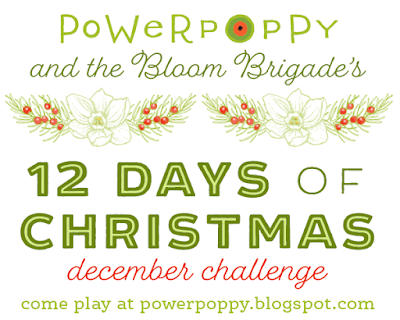 There are 12 possible ways you can enter, and tons of inspiration we’ve given at the Power Poppy blog over the past few weeks. Be sure to check out the first day and entry spot HERE, and a summary of all the 12 Days of inspiration are HERE. 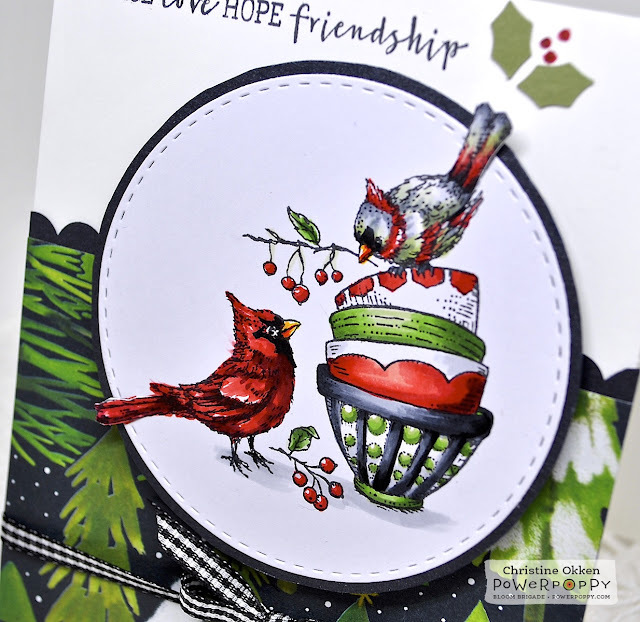 Wowsers... what a great way to use up that pretty paper Marcy always sends Christine! Your colouring is truly beautiful! Merry Christmas to you and your family! Love those crisp, beautiful colors with the white. Your coloring always gives me such inspiration, Christine. Merry Christmas to you and your lovely family! Oh, Christine! I love the papers Marcy uses to wrap our stamps, and what a very special one this is. I absolutely love the sweet image and your gorgeous coloring! And what a sweet tag too! Beautiful! Hope you had a blessed Christmas, dear friend! Hugs!